The Aurak homeworld is 2 thirds ocean, much of it deep, with jagged dark ocean floors, a third of their world is barren rocky land, with a few volcano's, their world could be described as in the early stages of evolution of life, but by chance, the Aurak have managed to evolve sapience before land life has evolved, as such dry land is barren bar a few microbial matts near ocean edges and just beneath the ashy soil. The shallow ocean around the land is vibrant and colourful and rich in aquatic life, but the aurak dwell in the deep sea, only comming to shallower waters to mate and reproduce. The homeworld orbits a main sequence star, as a moon of a blue gas giant, roughly three times the size of jupiter, the moon is slightly larger then earth. no other planets exist in the system, all bodies are either one of the 30 moons of the gas giant or a rock within the dense and thick asteroid belt between the planet and the star. The Aurak are an isolationist society, having developed in the dark abyss of deep ocean, where abundant life is scarce they are not familiar with other life as much as an alien race on a rich world would develope on, they also dont trust the "air-suckers", races that breath air and live on land, the concept of terrestrial creatures being alien to them, they are a sapient species with limited art and culture. They dont really have a religion, and generally seem an emotionless race. Their government seems to basically be a council of 70 elders, oldest of their species, denoted by the red blotches that steadily appear over their back armour plating, and who have the largest gill frills on the side of their heads, which durring early adulthood are small and almost un-noticable. Their society doesnt seem too factionalised, and disputes between members of the council are rare...mainly because there never seems to be anything that gets the Aurak worked up over, the council's only job is to maintain what little of Aurak society needs maintaining, and generally running any species wide affairs that emerge. 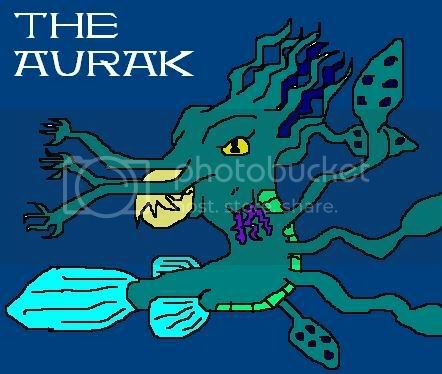 The aurak have developed space faring technologies, but technology seems generally abscent from common Aurak life, the Aurak only have one city, in an ocean trench, where the technology and culture of this species occurs, the rest of aurak live in their natural habitation, only building coral shelters in small groups. The space faring technology is only used for defence of the system from other races and the Aurak rarely venture beyond it, but no alien race is permitted within their system and will be assaulted vigourosly if they break the perimeter of Aurak system space. The Aurak reproduce by mating ritual within the costal shallows, they will all meet, and females choose a mate by how well he can change his skin pigmentation in a courtship display, they them grasp front tenticles, the female releases her eggs and the male releases his sperm. Any fertilised eggs will drift with the current out to the ocean and slowly sink, and develope into a larvea, picking off dead animal material from the ocean floor, or feeding on plankton like creatures on the way down. Once they reach adulthood, they will join up with a troop of Aurak, and actively predate on small ocean creatures that dwell in the depths. Nice creature! Good backstory. I'm more intersted in the guy in your avatar though. The "Guy in his avatar" has his own thread.